Mussels have traditionally been a well-accepted seafood in many countries of Europe, particularly France, Italy and the Netherlands. Mussels have traditionally been a well-accepted seafood in many countries of Europe, particularly France, Italy and the Netherlands. But it is only in the last few decades that the potential of their cultivation has attracted any significant attention. The very high levels of production obtained by raft culture in the rias (submerged river valleys or fjords) of Galicia in Spain aroused the expectation that mussel culture may be a quick means of solving the animal protein needs of the populations of the Third World. Notwithstanding the fact that the productivity of the Galician Coast cannot be dupli cated everywhere, and that many years of work will be needed to promote and popularize mussels in many parts of the world, there is undoubtedly very considerable potential for substantial increases in the production of mussels for direct human consumption or as feed for other valued aquaculture species. mussel culture is largely based on the blue mussel, but the green mussel and the black mussel, M. crassitesta, are also of some importance. 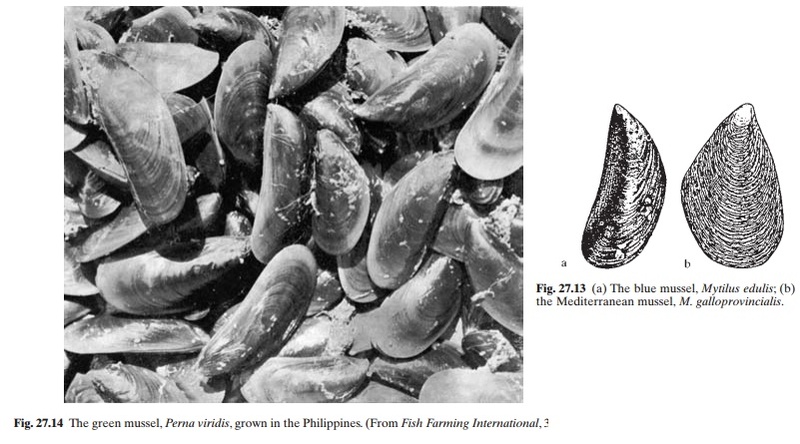 Experimental culture of mussels in India includes the brown mussel, P. indica. The green mussel cultured in New Zealand belongs to the species P. canaliculus (fig. 27.15), and the main species in Venezuela is P. perna. Like other bivalve molluscs, mussels are filter-feeders, feeding on phytoplankton and suspended organic particles. In nature they live in shallow water, attached to hard substrates. However, they can displace themselves both horizontally and vertically with the aid of the extensible foot, and attach to new substrates by the production of new byssus threads. They often attach themselves to the shells of other mussels, forming large mussel congregations. The sexes are separate and spawning occurs throughout or for long periods of the year, depending largely on temperature conditions. Millions of eggs spawned by the female are fertilized by the sperms of males spawning simultaneously. Embryonic development is fairly fast, and in the blue mussel the ciliated trochophore stage is reached within about 24 hours after fertilization.The planktonic veliger stage is reached in 48 hours and at a shell length of 0.25–0.30 mm they can attach themselves with the byssus thread to any filamentous object, including weeds and hydroids. It is reported that in the absence of a suitable substrate, the final metamorphosis can be delayed for up to 40 days in temperatures of about 10°C (Bayne, 1965). The blue mussel reaches the market size of about 5–6 cm shell length in one to three years. Its life span is believed to be not more than four years.